International Journal of Intercultural Relations 19(2): pp. 197-209. Elsevier Science / Pergamon (1995). 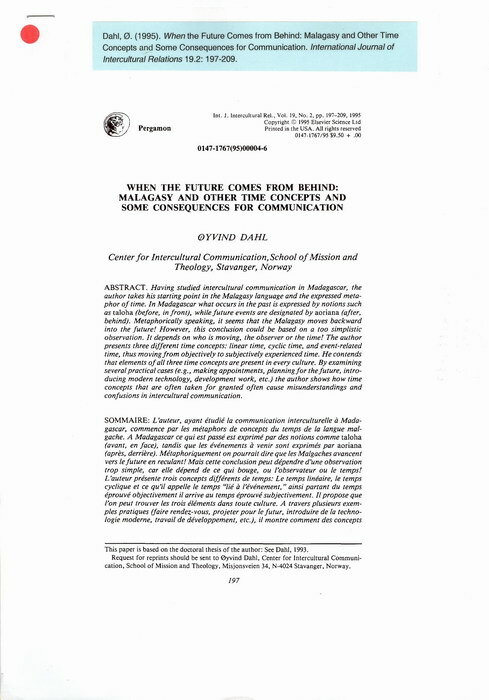 A paper about the Malagasy concept of time and implications for intercultural communication. Having studied intercultural communication in Madagascar, the author takes his starting point in the Malagasy language and the expressed metaphor of time. In Madagascar what occurs in the past is expressed by notions such as taloha (before, in front), while future events are designated by aoriana (after, behind). Metaphorically speaking, is seems that the Malagasy moves backward into the future! However, this conclusion could be based on a too simplistic observation. It depends on who is moving, the observer or the time! The author presents three different time concepts: linear time, cyclic time, and event-related time, thus moving from objectively to subjectively experienced time. He contends that elements of all three time concepts are present in every culture. By examining several practical cases (e.g. making appointments, planning for the future, introducing modern technology, development work, etc.) 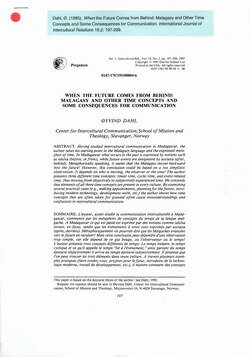 the author shows how time concepts that are often taken for granted often cause misunderstandings and confusions in intercultural communication. The abstract is given in English, French, and Spanish.